Season Twenty Four ran from September 7, 1987 to December 7, 1987. It contained fourteen episodes across four stories. 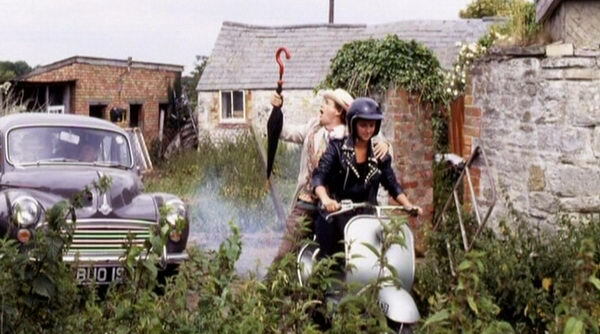 This was originally intended to be another season to span two Doctors but things just couldn't be worked out. As stated previously, Colin Baker was unceremoniously fired at the end of the previous season. Baker adored being the Doctor and was disheartened/pissed off at being fired. Then the production team remembered the whole regeneration thing and called him back up. If I remember correctly, they offered him the ability to do one more four-part story which would have him regenerate at the end. Baker countered that he would return but only if he could do the whole season (as he really wanted to be the Doctor for eight seasons, but three would be acceptable) and would regenerate at the end. When they refused, he refused to return at all, even for his regeneration scene which now had to take place at the very start of the first episode. In came Sylvester McCoy who held a great many number of small entertainment jobs but never as a serious actor before this role. As Diamanda Hagan says "he was a crapper reboot of two." He was short, comical, and generally non-threatening. This season he's just sort of there being a goof more often than not. Thankfully that will change next season as he re-vamps his Doctor and the new script editor, Andrew Cartmel gets to really sink his teeth into the show. Till then we are stuck with this. Thankfully this season contains the last of the truly terrible episodes. It's all uphill after this... though that will only last for two seasons. In this season we also finally say goodbye to Mel, and gain the last of the iconic companions (and last companion of the classic show) in Ace! The first story is Time and the Rani and it's four episodes long. The TARDIS is mid-flight and is shot down by the Rani. The Rani has been ruling over the planet Lakertya and is in the process of creating a time manipulator. However, she needs the Doctor's help to get it right. Due to the TARDIS falling out of flight, the Doctor regenerates as his companion Mel gets separated from the TARDIS. Mel is lost on the planet and must avoid traps set up by the Rani as well as the giant creatures she keeps called Tetraps. Mel joins forces with some Lakertyans who wish to defeat the Rani and take their planet back. The Rani, utilizes the Doctor's post-regeneration madness and disguises herself as Mel in order to have him fix the time manipulator. She plans to utilize this time manipulator by pooling the most ingenious minds from the past, present, and future in order to control time anywhere in the universe. 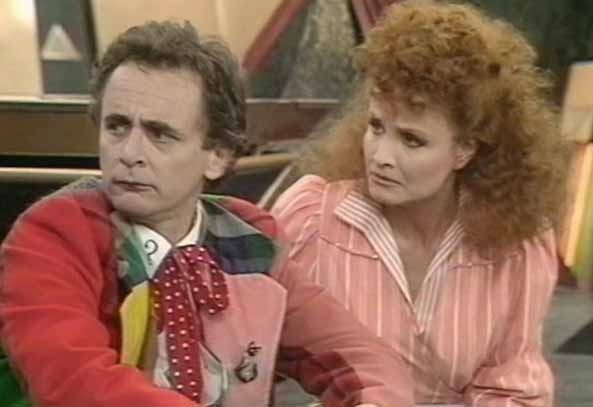 The Doctor must overcome his madness and stop the Rani before it's too late. This is the last truly terrible story of the classic show. The last time we saw the Rani she was amoral and just a scientist. Without the Master to look better than, she's just sort of turned into a female Master years before that actually happened. Her plan makes no sense whatsoever and a lot of the story seems like bizarre filler. Literally the only thing worth watching is the Doctor doing all his post regeneration stuff like being forgetful and changing his outfit many times. Everything else is really really bad. Give this one a skip. The next story is Paradise Towers and it's four episodes long. 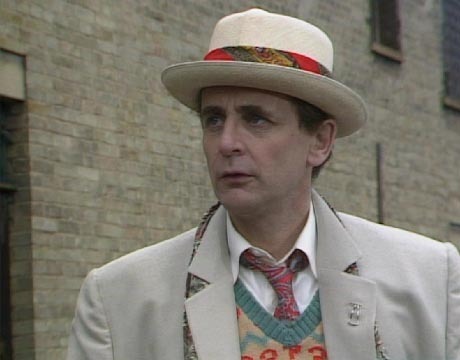 The Doctor has decided to take Mel to an apartment building known as Paradise Towers with a really great swimming pool as a sort of vacation, however everything has gone to crap since he had last been there. When most of the planet went to war, the building was somehow completely forgotten by the rest of the planet and as such has fallen into a sort of dystopian society. The building is divided between two gangs of teenage girls, the Red Kangs and Blue Kangs who are having a turf war. There are a group of fascist caretakers who are ruling over the apartment tower, a robot who is killing people and feeding them to the disembodied mind of the original creator of the tower named Kroagnon, and cannibal women living in the apartments who try to eat Mel at least twice. The Kroagnon's mind eventually gets strong enough to take over the chief caretaker's body and decides to eliminate all life within the apartment. The Doctor and Mel must get the remaining caretakers, residents, and gang members to work together against the Kroagnon and his robots to bring Paradise Towers to true peace. This story is incredibly eccentric and weird. The first time I watched this, I was scratching my head at all of the strange things crammed into this story. Many people don't like it but I have a real soft spot for this story. I mean, where else could you find fascists, cannibals, teenage girl gangs, and crab robots in the same place and it still actually make some semblance of coherency? That being said, this is the best showcase of why Mel is considered the worst and most annoying companion as she spends a fair majority of this story making snide comments or screaming. I love this story but you may find it's particular brand of strangeness a bit too much. The next story is Delta and the Bannermen and it's three episodes long. 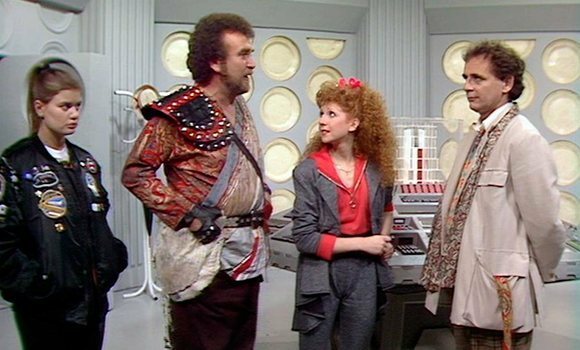 The Doctor and Mel arrive on a touring spaceport and become the ten billionth customers thus winning a trip to Disneyland on earth in the 1950's. Mel climbs on the time ship with the others (which is disguised as a 50's bus) while the Doctor follows with the TARDIS, however the bus hits a satellite and lands at a holiday camp in South Wales who happily accommodate the visitors. Mel rooms with and makes friends with Delta who is the last survivor of the Chimeron race along with her egg which is about to hatch. The Bannermen, who have been slaughtering all of the Chimeron race land on Earth to finish their genocide. A local welsh man, Billy, falls in love with Delta and his girlfriend, a biker named Ray becomes involved with the alien intrigue. The Doctor, Billy, Ray, and Mel all try to protect Ray and her newly hatched daughter resulting in a showdown at the holiday camp. The Doctor uses the daughter's high pitched scream to incapacitate the Bannermen allowing them to be captured. Billy decides to leave with Delta and her daughter and drinks a chemical compound that turns him into a Chimeron so that they can rebuild the Chimeron race. This one isn't that great but it's much better than Time and the Rani. It's an interesting look at all thing 50's through the viewpoint of the 80's. There's a lot of 50's rock music involved and Ray is absolutely awesome. In fact, Ray was one of the two contenders to be the next companion. A 50's biker chick would have been fantastic to go with although I'm certain they made the right decision by going with Ace. The daughter's quick aging which I didn't mention was a bit hokey but overall this was an ok story with an interesting double act in the two American agents trying to track down the satellite which the bus struck. Not great but you may enjoy it for it's 50's-ness. The last story of the season is Dragonfire and it's three episodes long. The Doctor and Mel land on Iceworld, a place for travelers, crooks, mercenaries and anything else that space may have in store. There they meet Sabalom Glitz again who is in search of treasure rumored to be guarded by a dragon on the planet. Mel and the Doctor meet with an opinionated waitress named Ace. Ace is actually from Earth in the 80's but her homemade explosives somehow propelled her to Iceworld where she's been stuck for quite some time. While this is going on, a guy named Kane, a human-looking alien who has to live in subzero temperatures in order to stay alive is trying to also find the dragon's treasure so he can return to his home planet after millennia of exile. Eventually they find that the dragon is actually a sort of robot and the treasure is hidden inside it's head, which the Doctor takes for safer keeping. Kane captures Ace and offers her life in exchange for the dragonfire. The Doctor hands it over but to Kane's surprise the planet he thought he was on has mostly melted away due to the nearby sun. Distraught, Kane opens a screen on the surface of his ship to see the sun which melts him away. Mel decides to travel with Sabalom to keep him in check and the Doctor extends the invitation to Ace who accepts. Like most of the stories this season, it's also kind of weird. It does a good job of introducing us to Ace and the character of Kane with his underlings is a fun concept. If you think the logic of Ace having simple homemade explosions that ripped a hole in space and time depositing her in Iceworld is stupid then....congrats you are right. It is stupid, very stupid. In fact, this was dumb enough that they decided to retcon it in season 26 to something else, but we won't know what that is now. Also this story is famous for having the dumbest cliffhanger sequence in all of Doctor Who. The Doctor is trying to track down the dragon and decides to jump a retaining fence and sort of slide down his umbrella though there is a deep chasm below. What exactly was he thinking/doing? He could have seen there was no way down before doing that. If you want to see Ace's beginning then take a look at this one. It's not that bad just has a bit of stupid in there. That was season twenty four. 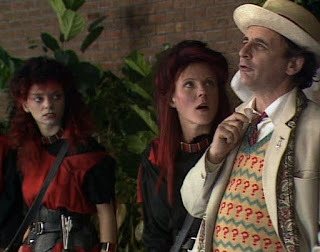 It's kind of hard to be overly excited about Sylvester McCoy's first season because so much of it was wrong... not necessarily horrible just wrong. Considering we had a story intended for the Sixth Doctor, quite possibly the worst companion in the show's history, and a poor representation of the Seventh Doctor's personality, I think this came out better than expected though still not excellent. It was an odd little hiccup of a season with a fair amount of imagination. While some of these stories are still bad or even terrible you can sort of tell that the show is going on the right track once again: it won't become truly good again until next season. Please join me again as we continue to examine all of Doctor Who.